The Toyota Tundra is full-size pickup truck offered from the Japanese carmaker to fight in the strong full-size truck class with names like Ford F-150, Ram 1500, GM Sierra and Chevy Silverado. This model has been in its second generation since the 2007 and since then it introduced some upgrades which made this vehicle better but not certainly enough to catch mentioned rivals. The biggest changes for a last few years were presented for 2014 model year when model got new refreshed styling, revamped interior, improved electronics and safety and new 1794 Edition trim as well. The year after this significant facelift, for 2015 model year, Toyota excluded V-6 engine version leaving this model with two V-8 units. It also expanded trim offer with new off-road TRD Pro trim. For 2016 model year only minor changes in trims and equipment happened. On the other hand this model year has brought redesigned the Hilux model which is sold outside the US and Toyota has also renewed its mid-size Tacoma. May be that was also the reason why Tundra was unchanged but for new 2017 Toyota Tundra big changes haven’t been announced either. However, this model is good truck with two engines that are capable to get the job done and its double cab versions are among the most spacious interiors on the market. As the things now stand, the engine offer for the new 2017 Toyota Tundra will be limited to two V-8 power plants. With this Tundra continues to lag behind the US rivals which offer wider engine range and many also include fuel-efficient diesel option. The base engine for the Tundra is a 4.6 liter V-8 which can produce 310 hp and torque max of 327 pound-feet. This engine as well as its alternative come paired with a six-speed automatic transmission. Standard is rear-wheel drive while it can also be had with all-wheel drive which includes a two-speed transfer case. The power numbers of this engine look adequate and comparable with other rivals but however these models offer more refined V6 which deliver similar horsepower. The fuel economy is also the flaw of this displacement and it returns 16 mpg combined in both two- or four-wheel drive configurations. The Tundras equipped with this engine will be capable to tow up to 6, 800 pounds depending on the configuration. Another V-8 that will be offered with this truck is larger and more potent the 5.7 liter V-8 engine. It raises the power output to 381 horsepower and torque figures to 401 lb-ft. This engine also works with a six-speed auto shifter and can be configured with either two- or four-wheel drive. Its fuel-economy drops to 15 mpg combined in both configurations. All Tundras with this engine will be equipped with a tow package and properly configured it can tow up to 10, 500 pounds. The styling of the 2017 Toyota Tundra will be familiar form. It looks brawny and capable and more traditional-like than more modern competitors from the Ford and GM. Its front side is certainly unique thanks to the large trapezoidal grille but in same time this design element makes its front look unbalanced and polarizing. The front bumper also features traditional look while hood is nicely sculpted. The side panels are well-balanced with sharply chiseled character line and squared-off fender flares. The tailgate area also features traditional design with vertical taillights. Inside, the Tundra delivers high build quality and attractive design. The higher trims also bring some fancier features but even the base models are well-equipped and they include touchscreen interface with smartphone compatibility. The dash has horizontal shelf-like design with broad center stack. The center console is also broad and tall and it offers big storage area. Controls in Tundra are also exaggerated and ease to use. Every trim in the Tundra is equipped with large and comfortable seats and even double cab models are generous with leg room in the rear row. The rear seats can be folded and then large storage area is opened in the rear section. The Tundra comes in wide range of configurations. The models are available in three body styles including regular cab, extended or Double cab and CrewMax cab. The Tundra can also be opted with three different bed lengths including 5.5 foot short variant, 6.5 foot standard and 8.4 foot long bed variant. Available trims include six options SR, SR5, Limited, Platinum, and two extra trims 1794 Edition and Trd Pro. The base trims include 18-inch wheels, air-conditioning, cloth upholstery, full power accessories, heated mirrors, keyless entry, etc. There are also touchscreen interface with smartphone compatibility, six-speaker sound system, Bluetooth and Usb connectivity and so on. The next SR5 trim adds exterior chrome elements, fog lights, upgraded infotainment system with larger screen and HD radio, etc. With TRD Pro comes unique styling elements and wheels, off-road tuned suspension with special shocks, off-road tires, leather upholstery and unique stitching, power-adjustable driver’s seat and so on. The Limited expands the offer with 20-inch alloy wheels, automatic headlights, and inside it adds dual-zone climate control, more speakers, navigation, etc. Stepping on the Platinum trim will get unique set of 20-inch wheels, premium sound system, front seats with power, heating and cooling functionality. On the 1794 Edition trim is included everything from the Platinum but this trim features unique interior and exterior. As the standard safety equipment, the Tundra offers antilock disk brakes, trailer sway control, traction and stability control, full airbag set and rear view camera. Additionally, it can be opted with parking sensors, blind-spot warning, rear cross traffic alert system, etc. The Toyota Tundra is authentic truck which has its qualities even it lags behind the competitors from the Ford, Ram and GM on many fronts. However, for those who want more traditional truck approach it can be adequate solution. Its base price will be around $32, 200. 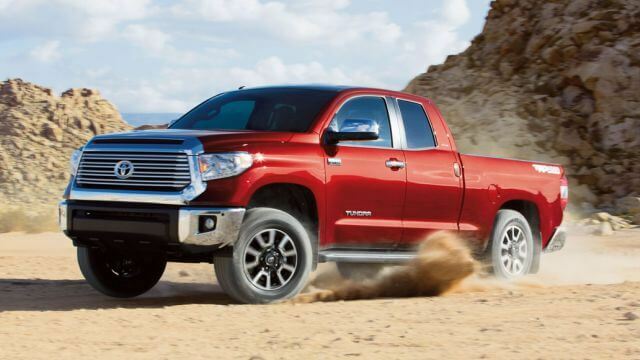 The new 2017 Toyota Tundra is expected to come late this year.